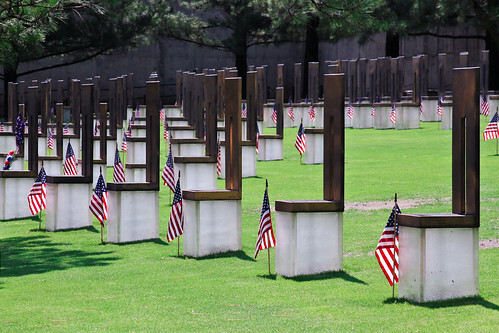 Back in May our family took a trip to Oklahoma and we were able to see the Oklahoma City Bombing Memorial. This was the first time I had been there and it was a quite emotional day. This is one of many pictures of the area. This is a field in the location of the original building that was destroyed in the bombing. The chairs are arranged in rows for each floor of the building. There is 1 chair for each person that passed in the bombing. Large chairs for adults and small chairs for the children. It was amazing to see the change in our country that happened when this attach.